$517.46 to go to hit my goal of $4000. I have been trying to come up with ways to stay motivated when I'm saving up and not paying down. I saw a neat thing on someone's blog (Debt Free Charts on blogspot) and while they were mainly focused on paying off debt with their charts, I took the idea and made up my own chart for my down payment. 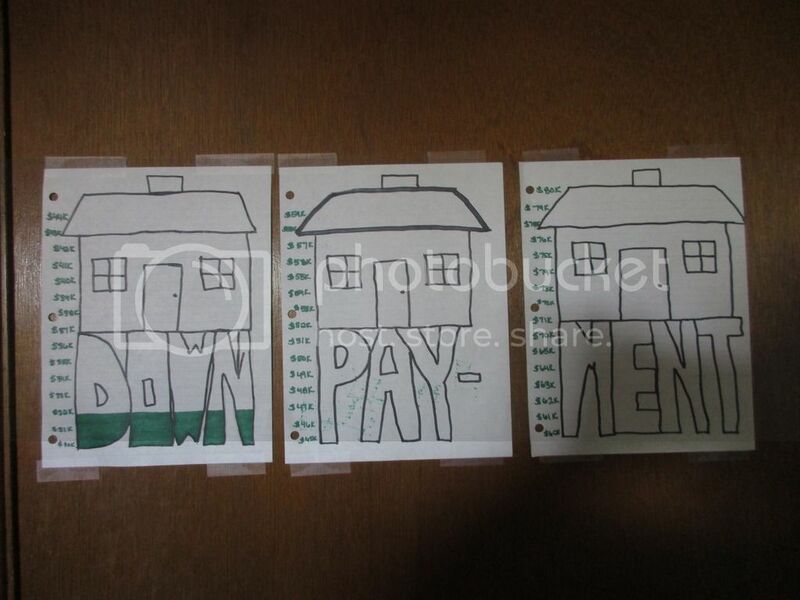 The idea is to mark off a line every time I have added $500 to the down payment fund. This way I can have a visual representation of our savings account growing that isn't just a number. I set the goal at $80,000. I think having the chart to fill in will motivate me. I really want something to. I put it on the back of my bedroom door so I have to see it every morning when I get up and every night when I shut the door. It will have a real presence in my life. I don't know if that presence will lead to urgency to save or not, but I have to think it will have more of a chance of doing that than doing nothing at all, right? That does sound like a great idea for motivation. I've also read about these glyph type designs where each circle/shape repreents a dollar value and once you have paid off / saved a set amount you color it in with marker. Then when you reach your total goal, you not only have the goal achieved, but you have a beautiful piece of artwork. If the use of a visual cue works for you for debt, it may very well work for saving. Good for you for looking to find a way to stay motivated instead of resigning yourself to feeling "stuck"!